A lot of sailors think hard about the start, and talk a lot about upwind speed and playing windshifts, but often the process of rounding the windward mark and transitioning onto the downwind leg gets lost in the shuffle. In sailboat racing, every tiny bit counts, and having a clean and successful windward mark rounding can gain you valuable boatlengths. The keys to rounding the windward mark are to make sure that you get there without sailing extra distance or fouling someone, and ensuring that you’re prepared for the next leg. Before the start, you should have made sure that you know where the mark is, and as you’re sailing up the beat, you should periodically check to see where you are relative to the mark. Pay attention to the laylines. If you will be approaching the mark on starboard tack, in most situations you will want to tack as close to the layline as you can – sailing beyond the layline means that you waste time sailing extra distance and you leave the opportunity for an opponent to come in, tack below you, and still make the mark. Don’t forget about current as you calculate the layline. If you’re coming to the mark on port tack, you may or may not want to go all the way to the layline, as Rule 18 makes it very difficult to tack inside the zone in a crowd without fouling. If you think that you will approach the mark close to other boats, you may find it more advantageous to tack three to four boatlengths short of the layline so you can tack without fouling. Once you’re on the layline, it’s time to keep sailing fast, but also start planning ahead for the next leg. Make sure that your mainsheet is not tangled and is free to run as you ease out. If you’re racing a spinnaker boat, do any final preparations. Also think about your strategy for the next leg. Will you want to work high or low on a reach? Is there a reason why you might want to jibe quickly around the mark? It’s also important to protect your position on the layline and make sure that you maintain clear air. If you’re on starboard tack and a port tacker is approaching, you may want to foot off a bit (well before they’re close so you’re not hunting) so that if they lee bow you, you can head up and maintain your lane. If you’re on port tack crossing a starboard tacker, you can avoid fouling by fully crossing them, and then tacking after you’re clear of them. You might round behind that one boat, but will not foul. Too often, port tackers try to jam in a tack on the layline or at the mark, and foul because they do not keep clear while tacking. You may lose that one boat, but sailing clean is sailing fast. Similarly, if you realize that you’re not laying the mark, the sooner you can tack out and reestablish yourself in a decent lane, the better. Imagine how much fun it is to hit the mark or have to jibe around at the last second – bailing out early may bruise your ego, but you’ll be better off in the long run. It’s very easy to arrive at the windward mark, happy that you’re there, and sit up and stop hiking. However, the mark rounding is like any other boathandling situation – you should use your sails and your weight to steer around the mark. Because you want to bear off, you should hike extra hard to flatten or overflatten the boat (in some conditions, boats with small rudders – like Lasers – simply will not head off if you’re heeled), and keep your jib a touch overtrimmed as you ease your main quickly. A quick summary of Rule 18 and windward mark roundings: If you’re approaching the mark and you will not need to tack, a boat that is overlapped at the zone gets room to round the mark. That can mean pinching up or shooting head to wind, and a boat outside will need to keep clear. So if you’re that outside boat, don’t bear off just yet! The trickier situation involves tacking inside the zone. 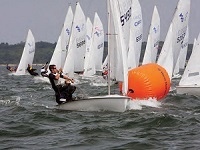 A boat that tacks inside the zone needs to first complete their tack without fouling, and then must not force the other boat to sail above close-hauled. So in that situation, you cannot force the other boat to pinch or shoot head to wind. Be careful! The way to avoid this sticky situation is to make sure that you complete your tacks outside of the zone. Once you have put all the pieces together, you can round the mark smoothly and start passing boats on the downwind. Good luck and have fun! Clemmie Everett is the Sailing Director at Noroton Yacht Club in Darien, CT and the Assistant Sailing Coach at Rye Country Day School in Rye, NY. A New Engine for American Promise!